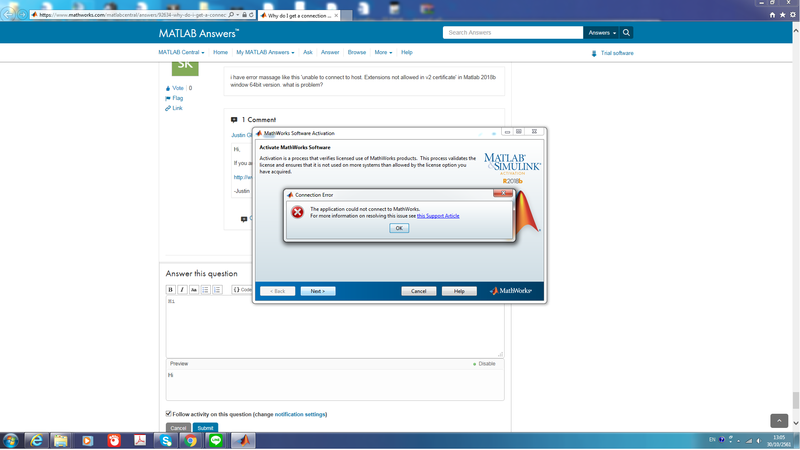 I get an error that I cannot connect to MathWorks when running the MATLAB installer or the activation client. However, I can access the website. Why can't the activation client connect to the MathWorks? Locate the Antivirus protection program icon on the Windows system tray. Right-click the icon and select Disable, Stop, etc. to temporarily disable the program. In some cases, you may need to open the program and disable it using the program's menus. Locate the Antivirus icon found on your Mac menu bar. Click Shut down or disable temporarily until installation and activation have completed. Locate the Antivirus protection program icon on the Linux system tray. The MATLAB installer, activation client and update installer will try to automatically inherit your computer's proxy settings on Windows. If this process fails, you may need to manually enter your settings using the "connection settings" button on the first screen of the installer or activation client. The update installer will not allow you to enter your proxy credentials as it automatically inherits your computer's proxy settings. On Mac and Linux, you will always need to enter these settings manually. Go to Menu and click on Preferences from the drop-down menu. Select the Advanced tab and then click on the Change Settings button. Click the Tools button and select Options. Click on Settings in the Connection Section and select No Proxy. You will need to contact your IT Help Desk to troubleshoot this issue if you don't know your proxy settings or the error persists after entering your proxy settings. You will need to contact your IT Help Desk if your organization is running a network firewall to configure it to bypass blocked connections to the MathWorks servers. Your firewall needs to bypass blocked connections for both addresses over both ports. These servers do not use a Static IP Address and will resolve to a Dynamic IP Address. This means that users will not be able to white-list MathWorks servers via IP Address and will have to use the domain name. Mathworks site says it is down for planned maintenance. How can you install? The message that appears when you visit these addresses in a web browser is not accurate, as those addresses are not intended to be visited in a web browser. The activation servers are up. I apologize for any confusion caused by that message, and we are working to replace it with a more accurate message. While installing through the iso file which my University( BITS Pilani , India) gave me with a Activation Key(through which I got the license on the website) During installation , After I login ,Everything goes smoothly till I have to select my license . When I click next , it says cannot connect to MathWorks Server. I have tried this on R2015B release , R2015A release both. Same error. Please help. Same issue. Please help resolve. Idk whether to contact college admin or Mathworks. None of them responding anyways. @Rajat Mishra For faster response, it is best that you contact MathWorks Support directly and create a help ticket. You may have a system specific issue, which I am sure the team should be able to help you out. ---> It could be related to the way the network(s) you're on are configured with IPv6 and an incompatibility with the installer. Please try running the following from a command prompt, then try the installer again. - I ran those codes in command prompt, restarted the installer and everything worked like a charm! I just clicked ok on the warning screen and tried to activate again. It seemed to work without further manual intervention. the "setx" should be run at a Windows command prompt. I put in the proxy information during the installation, and the installation completed without error; but I still can not get the installed application to log in, rendering it useless, unless there is a way to check the configuration files that contain this information for the application. (Oct 20, 2017 16:32:24) /Users/spoccyl12/Downloads/MathWorks/R2017b/archives doesn't exist ... skipping. (Oct 20, 2017 16:32:24) Archive search complete. 19 total files found. Your installation may require additional configuration steps. (Oct 20, 2017 16:41:51) End - Successful. Weird that the error goes away on my VPN and not on home internet without any firewall. Same. VPN works for me. TY! Hilarious!!! VPN was the easy fix. Thanks guys! When I received this error, it was not due to proxy settings or firewall settings. Rather, when I downloaded the installer, the download location was on a remote drive (a windows remote profile DFS location). I copied the setup file to the local drive, and it ran fine. Similar here - got this error with many internet connection settings when running the installer from my user desktop. Moved the installer to the local drive (C:) and ran with admin privileges and it worked fine. Can anyone from MathWorks explain why the installer for many releases of MATLAB inaccurately complains about proxy servers when run from a network drive? Same here. Moved the installer file to C drive and then it worked. I turned off my firewall and I still can't connect to Mathworks. I had the same problem and followed all instructions above about filling in proxy-server information and deactivating the firewall etc. but nothing worked. Turned out all I needed to do was uncheck the box which indicates to use a proxy server. It is as mentioned in other links found in Control Panel/Internet Options/Connections/Lan Settings. Had the same problem. Now it works. Thanks a lot! I had the same problem. Now it works. Thanks a lot! On a Mac (running 10.10 [Yosemite]) I still needed to temporarily disable the Firewall (under System Preferences > Security & Privacy) in order to complete activation. Had the same problem on my Mac and I have never had a problem like this on a Mac since I have used them. (Probably more than 8 years.) My laptop did not have the firewall turned on at all during all attempts. So this is probably just badly written software from Mathworks. What worked for me is to use my hotspot. That is all I changed - connect to my Karma hotspot and click "Next" again. Done. Note that I first did the same after connecting to my iPhone as a hotspot and that did not work. (Just clicked "next" and got the same error message.) However, that could have been that my phone was having a connection issue. Mathworks- please look into this issue and fix it. The software should not require special proxy settings. Me too, maybe you should try it for a couple more times. I only successfully installed it after 10 times, but I made it at last. I can only use hotspot to install. Have tried every method that I can imagine. Windows 7 64-bit. What am I doing wrong? "Error : unable to connect to host. sun.security.validator.ValidatorException: PKIX path building failed: sun.security.provider.certpath.SunCertPathBuilderException: unable to find valid certification path to requested target"
Any instructions how to handle this problem? Thanks in advance. This is what I did to successfully install Matlab (Home Use) on my Windows 7 x64 SP1 system. Note that I do not know which one of the following things helped to make things work; I just did all of them. Also note that I am not using a proxy server, if you are, this will probably not help you. 1. Turned off internet router and then turned it back on. 2. Restarted the PC in Safe Mode. 4. From control panel->administrative tools->Services, I right-clicked "Windows Firewall" and selected "Stop". 5. I ran the Matlab installation file from c:\. 7. A dialog appears to enter your login credentials: do that and the installation will continue. 8. The installation will eventually complete and then you can activate it by following the on-screen directions. 9. I restarted the system normally and verified that Matlab was working. I had this problem as well, but I found that it was because my internet connection was too slow. So it only worked when I used a faster connection. Beware that the downloads during installation are rather large files, including the toolbox add-ons. Hope this information can be of help to others. I had the same issue but it must have been my connection speed, because it worked on the third attempt without me actually changing anything. I'm pretty sure that login.mathworks.com is down (at least I'm not able to ping it). And that's why you (and me too) get this connection error. As of 9/9/2017 login.mathworks.com seems to be still down. Having the same installation issue. Is there a fix? Today, Sep-11-2017, and server login.mathworks.com is still not responding! Oh, that would explain a lot. Turn off the Wifi of the institution you are in, then turn on Mobile hotspot on your phone to share the mobile connection (if you have 3G or 4G). You will pass the first steps and it will start downloading. When it starts downloading, switch to the wifi. It worked for me. I had this issue and it was not related to any network or connection. It was caused by a Malware I had in my PC called relevantknowledge. I uninstall it and it worked. Thank you very much..that was exactly my problem.. I am dealing with the same problem. After almost a week I tried to install matlab more than hundred times, then I got no solution at all. My windows firewall was off, no proxy setting, no anti virus installed, even no matlab installed yet. I am getting deperate with this problem because my deadline project comes closer, and I wasted the time too much to deal with this problem. Internet security software designed to block certain IP ranges such as PeerBlock have MathWorks black listed in the default block-list. Just set the blocked IP to "allow permanently" to let the installer connect and download your license details, software and associated toolboxes. Mathworks delivers some of its content using one of the major cloud providers. It might be the case that the cloud provider is what is blacklisted rather than Mathworks itself. I've also tried all of these tips, but activation via my account here doesn't work. So I tried using the File Installation Key process, but I always get the following error message: "Using a File Installation Key requires you run the installer from a MATLAB DVD or from a directory which contains files previously downloaded via the installer. To obtain the missing files, click Back on the previous screen and select Log in with a MathWorks Account or contact your MATLAB license administrator." I did get the licence code file and all. Any ideas? I need the software for a Coursera MOOC about Computational Neuroscience. Thanks in advance! Right. I have restarted the process multiple times! I've checked all the suggested settings and turned off windows firewall, but every time I get to the 'select license' page having logged in, it stops me from proceeding even though it clearly is connected as it got the details in the first place! Charles, i'm in the same position as you. I have coursework due tomorrow and this is quite a headache! I just came across this same error. At first, I assumed it was because I was installing on a Windows XP system. When I discovered that Win XP was still supported for 2015a, I decided to troubleshoot further. My resolution: The system could not communicate with the MatLab servers because the Date/Time on the system was inaccurate. - Setting the systems Date/Time correctly resolved the issue. The setup program was trying to go to the IP address of the mathworks site instead of DNS name. Had to add https://144.212.244.21 and https://144.212.244.16 to the firewall. It is unclear to me why MathWorks would use fixed IP addresses instead of DNS. Please fix this issue. The installer does reach out to the MathWorks servers using DNS, not IP address. The IP addresses for those servers are static, yes, but that's not what the installer uses to reach them. If the MATLAB installer is consistently resolving the wrong IP address for MathWorks service and activation servers on your machine, please contact MathWorks support so we can troubleshoot this issue. I recently faced the same issue on my Mac. It wasn't because I was using a network proxy (per se) or that the I had OSX's firewall turned on. Eventually I worked out that it was because of Kaspersky Internet Security. So I temporarily disabled that which then allowed the installer to work. Having this issue on a Mac with El Capitan. Confirmed with Network Utility that we could reach both ports 80 and 443 at both urls listed above. Firewalls were turned off on both individual machine and router. Suggestions? I have a problem with the process. I need log in with MathWorks account. The messenge is " The application could not connect to MathWorks. For more information on resolving this issue, see this Support Article" Please help me. I am facing the same problem and no reply for MathWorks support team. The following error was detected while downloading 3p/icu_win64_1438296709.enc: null Would you like to retry downloading 3p/icu_win64_1438296709.enc? If you press No, the installer will exit without completing the installation. Hepl please I got this error and it keeps on poping when trying to download????? This type of error usually indicates that security software or antivirus software installed on your machine is interfering with the MATLAB installer. To resolve this issue, add the MATLAB installer to your security software's whitelist, or disable your security software for the duration of the installation. I have got the same issue here and no idea what I should fill in on Server and Port. Please contact Technical Support using the Contact Us link in the upper-right corner of this page for assistance. thanks! I have submitted my ticket. I am attempting to install MatLab for the QUT Robotics course. I have downloaded the files but I cant install anything. It says it cant connect to Mathworks. In the Connection Settings box it is asking for information I dont know. It says I can leave it blank, but does not work that way either. I can't submit a Ticket as I have no License Number. I am on a home computer with a wireless modem. I have a Mathworks account. How do I install this program as nothing seems to work and I need to start this course now? I entered the user and password on the proxy server authentication screen and the following error message was found. "The application could not connect to MathWorks"
If you are still experiencing a connection issue during Install or Activation and have tried the solution listed above, then please contact MathWorks Support for further assistance. Our contact information can be listed in the link below. Dear Sirs The best answer for installing Matlab in Windows 10 was done by Dalan3r on 28 Sep 2016. Thank you Dalan3r! The buttons on the window "Mathworks Software Activation" are even broken now. All that work for nothing. Why are there always major issues with installations from Mathworks? Worked now by just opening a new window. I'm happy now! How To Fix Connection Error I can solve this issue. This is so annoying! Every six months it is a massive struggle just to download the latest update. It seems overkill that it is so protected!! Please mathworks do something about this. Anyone has a way of dealing with this problem beside asking for tech support? I have the same error on activating 2018a. Somehow it goes away on my VPN while never works on my Mac and home or work internet without any firewall. i have error massage like this 'unable to connect to host. Extensions not allowed in v2 certificate' in Matlab 2018b window 64bit version. what is problem? The ``Accepted Solution" does not work for linux. Issue: Trying to install matlab using the downloaded installer. At the ``Folder Selection" step, now infamous error, ``Connection Error" is thrown. However, the installer still isn't moving forward. Needless to say, every other website/service connection works. I am more inclined to think that the problem lies on the mathworks side rather than the users' side. Before this error, I had an unsuccessful installation due to my machine freezing. I am not sure why anyone would blacklist mathworks.com. TCP port 80, I believe, is for http, and I'm not sure how anyone would be able to browse any website with that port closed. Yet one of the steps of the solution is to open that port. My suggestion is to separate the operating system and not lump solutions together. Clearly, matlab behaves differently in different systems, e.g. the proxy settings. Tried one last time before quitting and now the installer is moving along. I even had the firewall restarted. I guess the best solution is to continue trying as few have mentioned. Maybe mathworks needs to look at it further. Then it did not work. I tried repeatedly some 10 times then it worked miracleously. ?! The above installation instructions claim that the proxy information must always be entered manually on a Mac, but the following instructions only address disabling proxy settings in browsers. None of the browsers seem to be using during installation, so their settings need not be changed. It's only necessary to discover how to configure the installer. I navigated Apple -> System Preferences -> Network -> Advanced -> Proxies, and found it was set for "Automatic Proxy Configuration", with a URL for a proxy configuration file. Inspecting that file, I found the appropriate proxy server. It didn't mention a port number, but I guessed "80". In the “MathWorks Installer” window, I hit “Connection Settings” (not actually mentioned in the instructions). I filled in the server and port, and left name and password fields blank. That worked. If you are still receiving this error then please contact our support team so we can assist. In my case (Ubuntu 18.04.02), R2018b installed nicely but activation only worked after a second trial. Not a big deal but if I remember well that was the same 2 years ago with R2016... Might be because the connection was idle a long time between installation and activation. "JAVA_TOOL_OPTIONS" with the value "-Djava.net.preferIPv4Stack=true"
"JAVA_OPTIONS" with the value "-Djava.net.preferIPv4Stack=true"
Run the installer. Afterwards the variables can be removed. I am using MacOS Mojave 10.14.4. I tried using my firewall turned off but it didn't work. I get "remote host closed connection during Handshake" error always I clicked install. With the firewall turned off, I restarted my system and tried to install again. This time it worked. Hope this solution might help anyone out there.